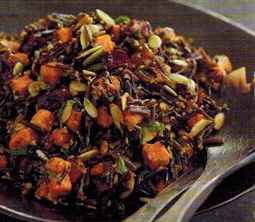 Wild Rice and Dried Fruit Pilaf - A recipe from Savor California, the online showcase for extraordinary gourmet foods and beverages from California. Combine chicken broth and wild rice in medium saucepan; bring to boil. Reduce heat, cover and simmer 40 minutes or until almost tender. In small saucepan, melt butter over low heat, stir in onion and brown sugar. Cook ten minutes, stirring occasionally, until onion is tender and lightly browned. Add to rice the cooked onions, raisins, cranberries, apricots, orange zest, orange juice and pepper. Cover and simmer ten minutes or until rice is tender and grains have puffed open. Stir in parsley, top with pepitas, and serve warm.